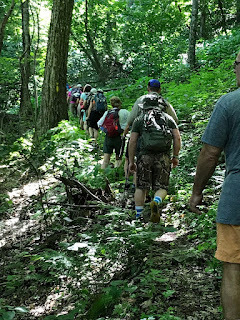 It is August, so it was humid, but the threat of rain did not keep twelve hikers from heading toward Sperryville for a hike up one of the premier waterfall climbs in the area. 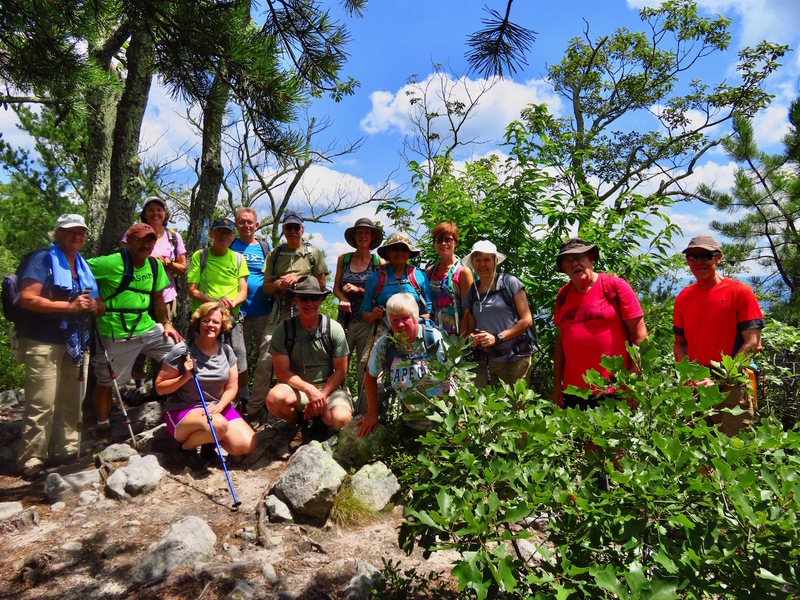 Hiking today were some veterans of this hike: Debra Fisher, Marian Styles, Michael Seth, and John Brandt, along with first timers for this hike: Nancy Handley, Tim Brown, Bill Holman, Ruth and Mark Walkup, and Karen and John Ballen. The group headed up the Little Devil Stairs trail and spread out according to how quickly they wanted to scamper up the rugged gorge. The water level was perfect, with enough to produce lovely waterfalls, but not enough to make the several stream crossings difficult. Rocky steps, plunging water and steep walls were some of the best features along the way. Most of us had our lunch at the base of the falls at the top of the Little Devil Stairs gorge, though some had hiked quickly ahead and ate there waiting for the others to join them. 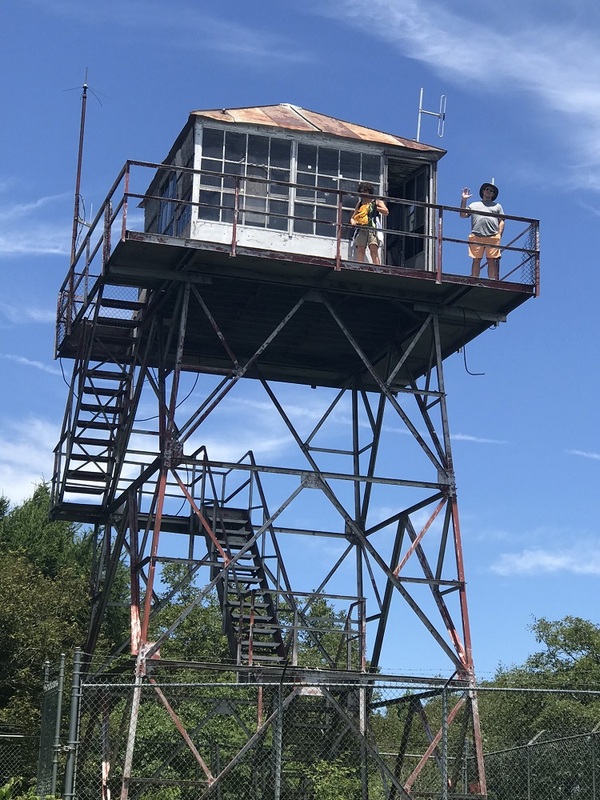 At the Fourway intersection of trails, Bill Holman and Ruth Walkup chose the 6 mile option down the Keyser Fire Road and returned to the cars for a nap while the rest of us hiked another 2 miles. While rain threatened, it never really materialized, so we were able to hike in cool temperatures past several more waterfalls on the much less popular Piney Branch trail. Returning up the Hull School trail, we visited the meticulously kept Bolen cemetery before descending the Keyser Fire Road to the cars. Unlike the morning, when the lot was overflowing, our cars were among the few left. 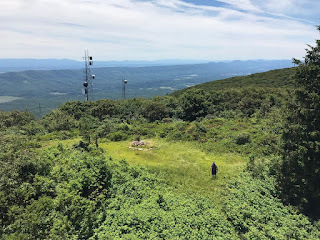 While the Ballens and John Brandt returned to Charlottesville, the rest of us headed to Headmasters Pub in Sperryville for a bite and beverages. 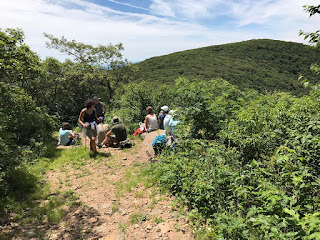 The Charlottesville hiking community was treated to an excellent presentation on backpack basics by someone who has done the Triple Crown of Hiking, Mark Perschel. Sponsored by the Great Outdoors Provision Company at the Barracks Road Shopping Center, Mark talked about gear choices, route planning, equipment management, safety and many more areas in planning a long distance backpack. Sprinkled with personal experiences, insights and “Big Fish” tales along with Snickers bar rewards for audience participation, the presentation was enjoyed by all along with the drinks and food provided by the Great Outdoors. 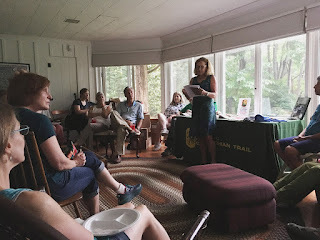 The Charlottesville Chapter of the PATC wishes to thank the Great Outdoors Provision Company for their help and support in making this interesting talk happen. 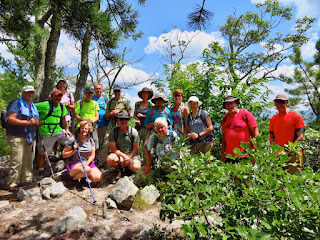 Claire Cline, Dave Borszich, Pam Heinrich, Heather Denny, Dave Bennick, James Fye, Theresia Barger, Anna McAllister, Lori Silvestri, David Schoemaker, Don Blume, Stephen Brong, Lisa and Glen Gray (their first PATC hike) and Jean Fraser met hike leader Michael Seth at the Food Lion in Elkton at 9:00. We carpooled for the 12 minute drive to the trailhead. The weather was a fine break from the recent rains, sunny but not too humid, with temperatures in the upper seventies. 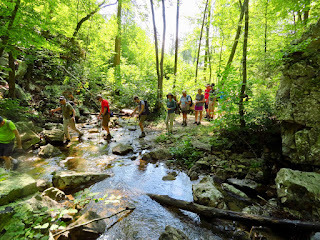 There was a lot of water in Boones Run making for a scenic hike along the series of cascades. It also made the seven stream crossings which we had to do twice an interesting challenge. Some people made all of the them with dry feet, some just waded across. We made the 1200 foot climb up to Kaylor Knob doing a little clipping the first half of the way. 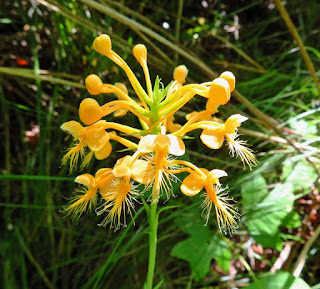 We saw some beautiful yellow fringe orchids along the trail and someone spotted the old CCC marker on the trail. We had lunch at the top where the rather creepy can with a woman's ashes was no where to be found as in past hikes. On an earlier hike, one person thought it was a geocache and put her hand inside, at least that didn't happen this time. 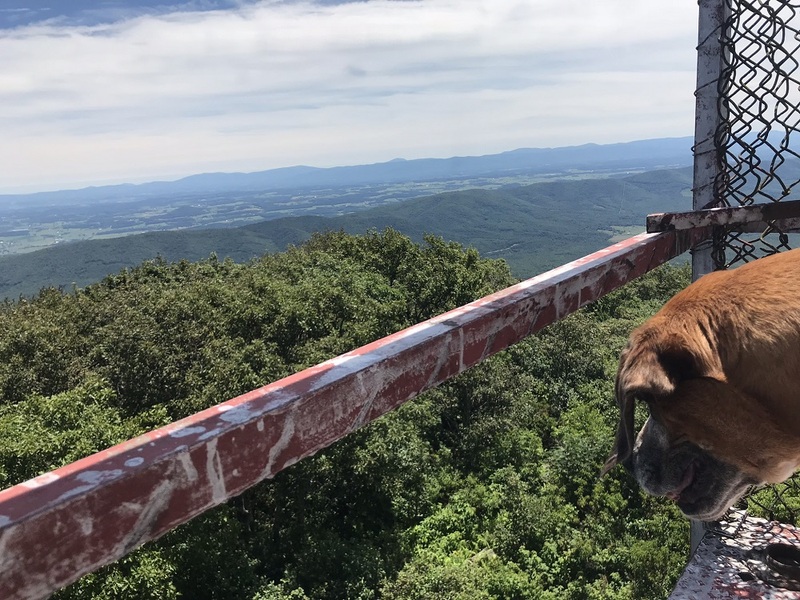 We met several people on top from the Massanutten Resort, but there were the only ones we met that day. 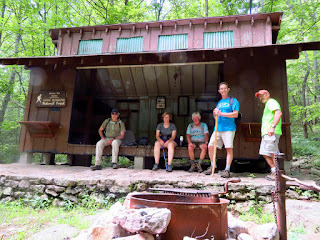 After coming down the mountain we visited Boones Run Shelter where its maintainer, Jim Fye, gave us a little tour. 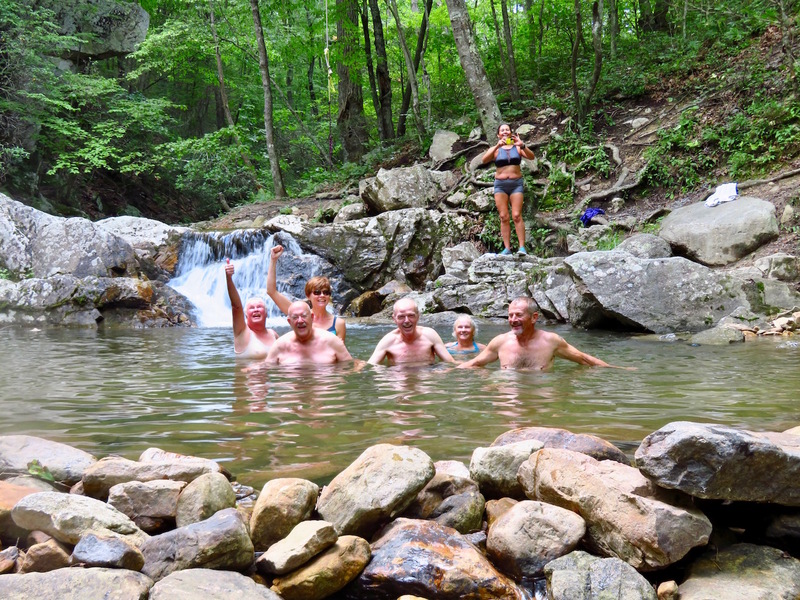 At the end of the hike we went to the swimming hole, eight people waded or plunged in; all reported that they were glad to have done so, the water was so refreshing cold. We got back to our cars shortly after 3:30. A large group 19 hikers scaled the western slope of Elliott Knob on the July 7, 2018 group hike for a combined Natural Bridge Appalachian Trail Club and PATC-Charlottesville event. Ascent on the Cold Springs Trail wasn’t always easy, as the trail needs some trail maintenance love, but the view at the top was spectacularly clear for a July day. 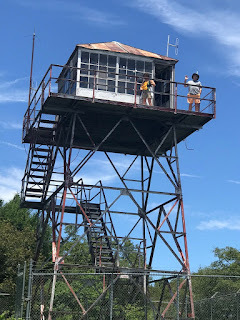 Views from the fire tower at the top easily exceeded 50 miles. PATC members included Marit Anderson, Anne Colgate, Nancy Handly, David Crowe, Marie Moss, Claire Cline, Marian Styles, Debra Fisher, and hike leader Jeff Monroe with dog Gracie. Newcomers included Ivan Via, Kody Kiser, and Andrea Collins. 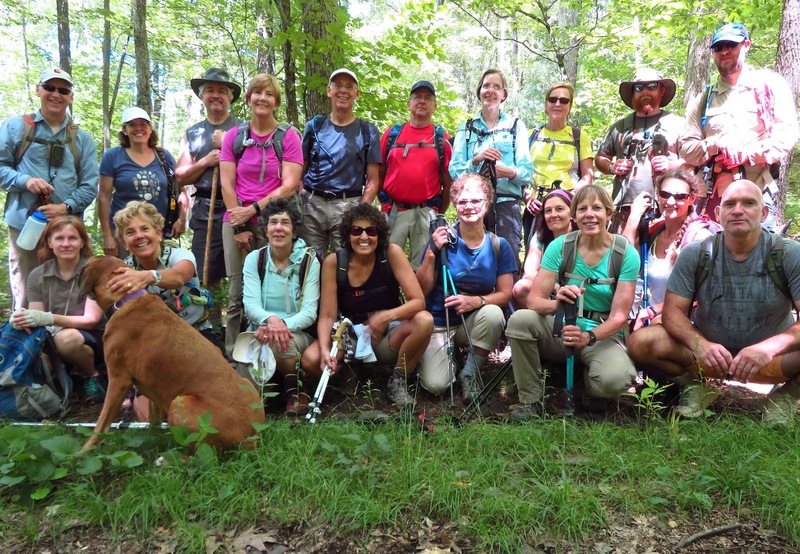 Five NBATC hikers joined the group, traveling from as far away as Bedford. 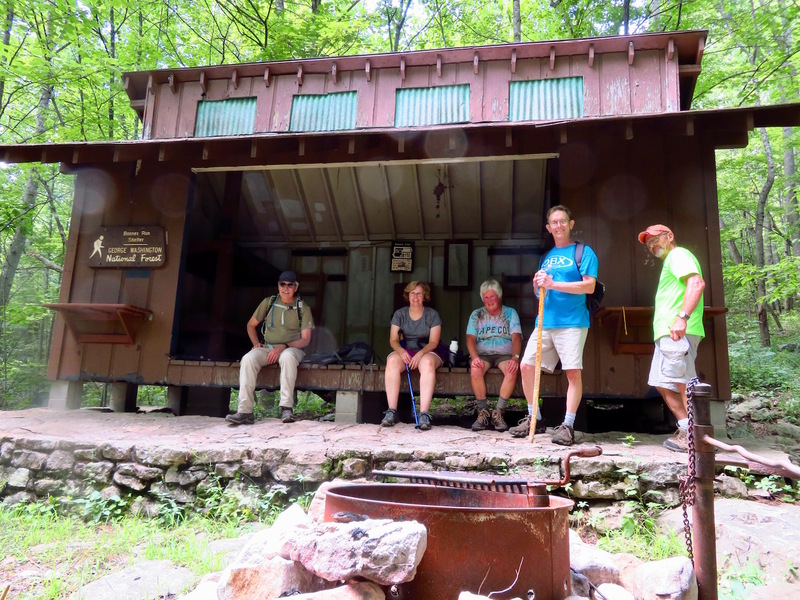 Several hikers also enjoyed talking and hiking with Hiking Upward website founder Tony Van Vugt, who traveled down from Ashburn for the hike. We held our annual Summer Pot Luck at Dunlodge on Sunday, June 10. 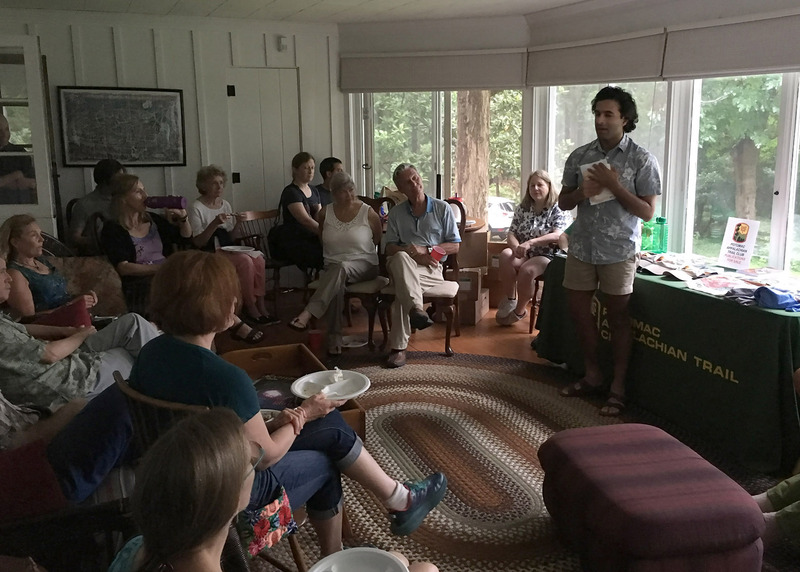 Despite a thunderstorm and power outage, the party went on with candlelight, a full crowd, many delicious dishes and refreshments, and a wonderful speaker from the ATC Board, Shalin Desai. Shalin is a former AT thru hiker and Triple Crowner, who is interested in increasing the diversity on the trail. 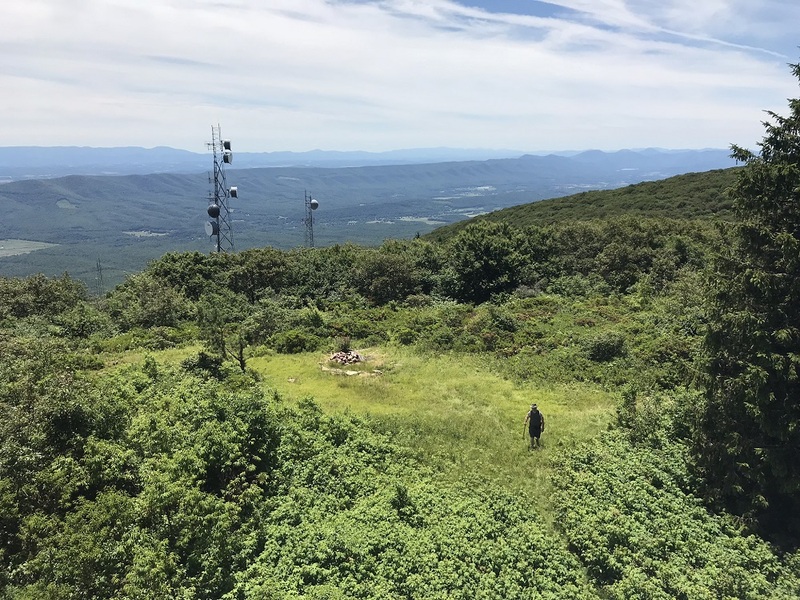 He is spearheading an initiative to support underrepresented communities on the Appalachian Trail through Affinity Groups. A Harvard business school graduate and soon to be law student at Vermont Law, he spoke eloquently and with conviction about his own experiences as a minority on the trail as an East Indian and LGBTQ association. Charlottesville PATC Vice President, Marit Anderson, is now a co-leader for the Women's Affinity Group and also spoke about her role with that position. 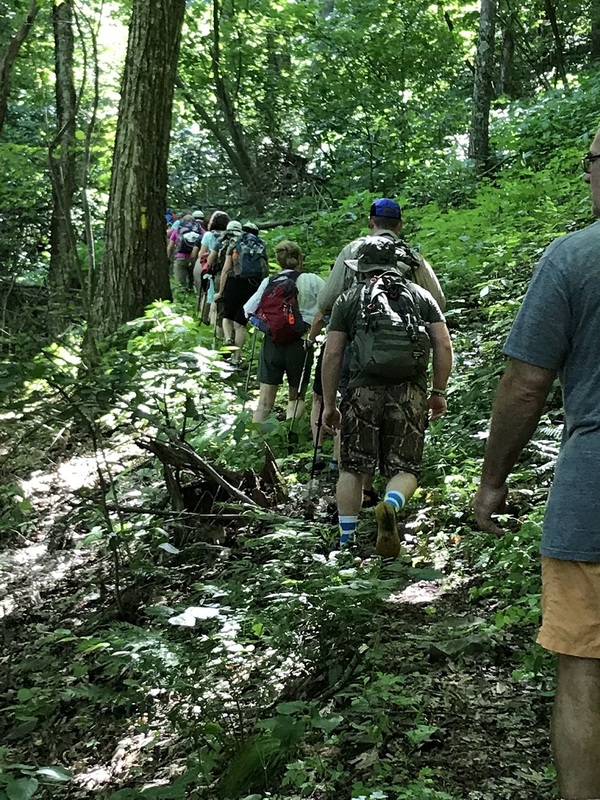 The purpose is to reach out to Women, LGBTQ, African Americans, Veterans, Youth, Latino, and Special Needs population to provide information, forums, and group events to draw more diversity to the trail. 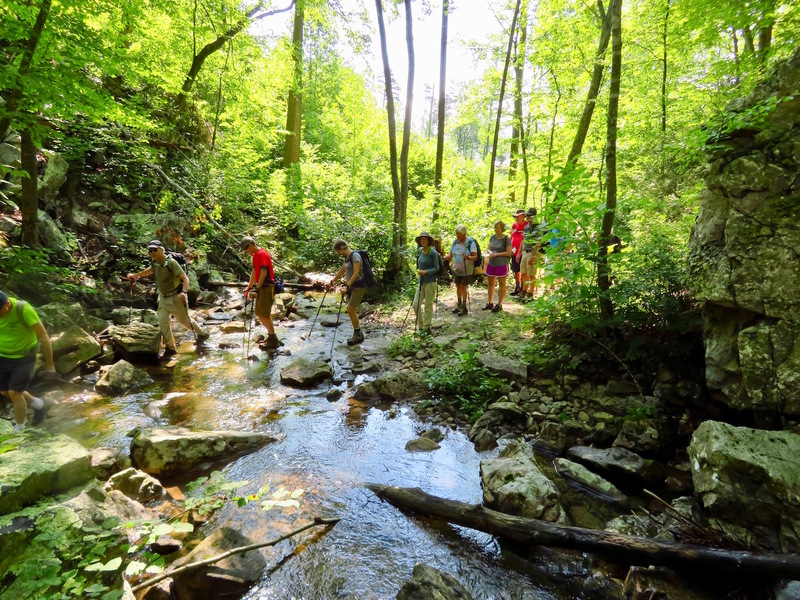 The intent is that more varied people experiencing the trail will bring increased interest in trail maintenance, financial support, and overall support for the future of the AT. We had another guest, PATC Supervisor of Marketing, Emeline Otey, selling maps, books, and other merchandise. Don White, PATC South District SNP District Manager was also present. With many guests and members to enjoy the evening, it was a well received by all.